For a good while now I’ve believed not only that bipolar disorder gave me the unexpected gift of creativity, but also that this very creativity became my way through and out of the illness itself—despite the ironic fact that the healthy “me” seems less creative than the symptomatic one. I’ve posted a significant number of poems, paintings, and drawings on my blog and have had readers suggest I organize an exhibit of my work. 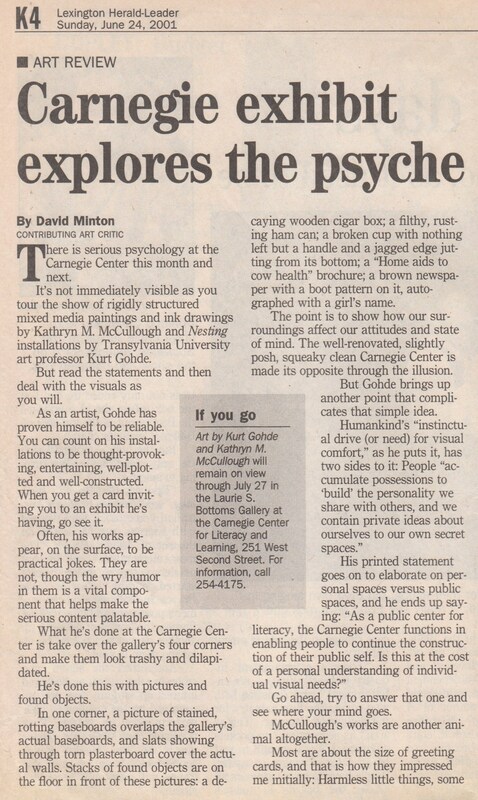 Today, however, I thought I’d share a newspaper review of an exhibit I did in 2001. I was hospitalized in March of 2000 at Eastern State—a psychiatric facility here in Lexington, Kentucky—a hospital whose actual treatment may, in fact, be better than its poor reputation would have us believe. It was not an entirely bad place. In fact, something rather good came out of the experience for me, as an occupational therapist noticed the drawings I was doing and recommended that upon discharge I contact an organization in Lexington called Minds Wide Open—a small downtown studio and day treatment program that took me under its creative wing and showed me how to submit an exhibit proposal and how to apply for a grant from the state arts’ council. I did both of these—ultimately getting an exhibit opportunity at the Carnegie Center and gaining a grant to defray the exhibit’s matting and framing costs. I had shown my work twice on a small-scale when I lived in Dallas, but nothing that matched the size and scope of an exhibit that opened at a reasonably well-known gallery on the evening of a Gallery Hop in downtown Lexington. Gallery Hops in our town happen one Friday night every two months from late spring through early fall and focus the city’s attention on approximately 30 participating galleries that open new exhibits that night and host a wine and cheese event from 5 till 7 pm. Art lovers roam downtown streets not only sipping and snacking, but also enjoying the work of artists the galleries show off during the evening. 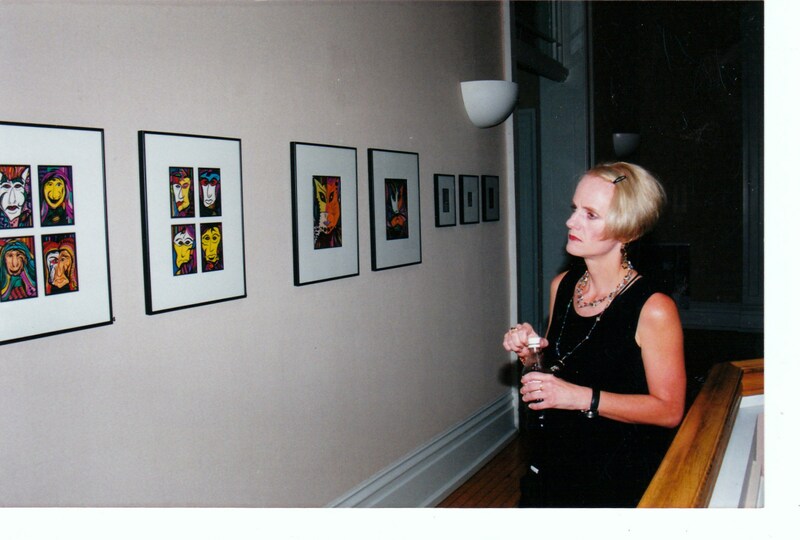 So I got an exhibit on a Gallery Hop evening in June 2001, and had my work featured two days later in the Sunday paper’s weekly art review. 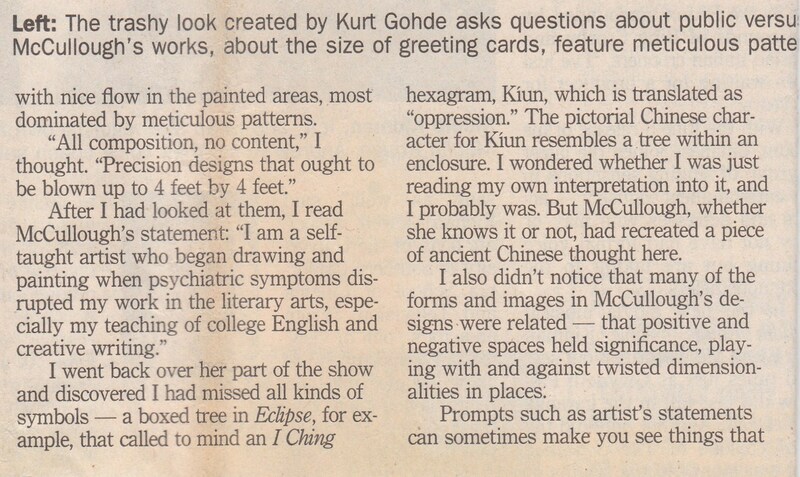 Unfortunately, no art sold during that exhibit, likely because I was still too sick at the time to interact successfully with Gallery Hop attendees, and the review in the paper was not necessarily glowing, a reality that I remember devastating me at the time. Unfortunately, the negative tone of this review proved more than my mind could handle at the time. I felt mocked and belittled by what I thought at the time was Minton’s implication that my work had less to offer than Gohde’s because mine was that of an unsophisticated and self-taught artist. Now, a decade later, I read the review differently and feel empathy for the “Kathy” of 10 years ago who unnecessarily considered this review a form of public humiliation and has not exhibited seriously in Lexington since, apart from one small show done at my partner Sara’s urging. Perhaps, it’s time to change all of that. It’s amazing the difference a decade makes. 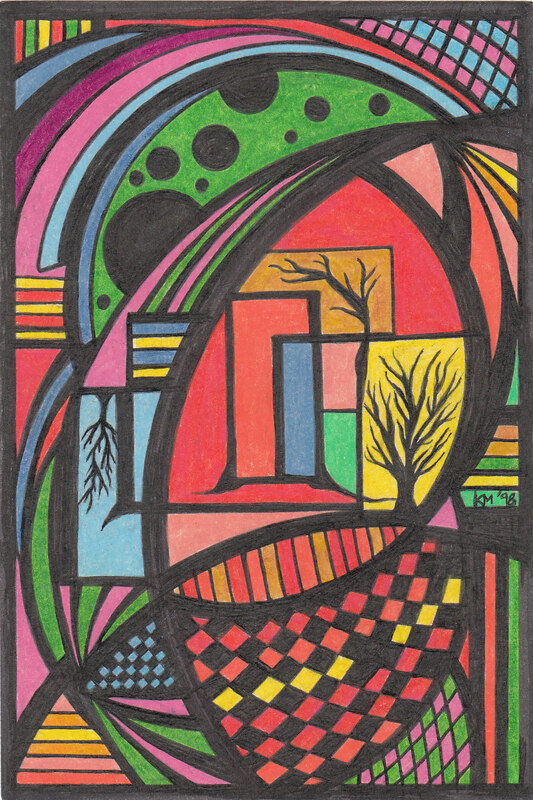 This entry was posted in aging, art, drawings, mental health, mental illness, Post-a-Day 2011 and tagged aging, art, bipolar disorder, Carnegie Center, Eastern State Hospital, Lexington, Lexington Herald Leader, life, mental health, mental illness, postaday2011, psychology, recovery. Bookmark the permalink. A celebrated artist as well…. Not “celebrated,” I’m afraid. This reviewer didn’t think much of my work, but, hell, I know a lot more about him as a reviewer, as well, now–so I think there may be more going on in this piece than meets the eye. I’m looking forward to your visit in July! I was thinking, as I was reading the review, how it says a lot of good things. I hate reviews and articles about me and my work because I often cannot read past any small negative to focus on the immense positives. It seems to me that your brain, which was still raw from your experience, did the same thing. I’m glad that you can read this review now and see the difference. Every piece you create blows me away Kathy. I hope you put together another showing. I am sure it will be glorious! I think Eclipse is beautiful. I don’t know anything about art, just that I like it or I don’t. I think a LOT of people are the same way, they either like it or they don’t. When I read the reviews I can’t even figure out what they are talking about. When you said “I sought nonverbal means to articulate the challenges I faced” – that makes sense. I ‘get’ that. I sincerely hope you take comfort in the fact that YOU enjoy your own artwork. And taking the step to display it for the public – that took some serious courage. Good for you! Yes, you are so right. I guess it did take guts. I hadn’t considered that possibility–that’s good to think about! I’m so glad you enjoyed Eclipse. It is one of my personal favorites, I think–but I’m like you–I don’t know why I like it, really. I just do. Perspective is an odd thing, as I didn’t read the review as negative — not a rave, either, but definitely not negative. I liked the piece of art shown, and your statement was both moving and powerful. Kathy, I’m with your other commenters. It’s a shame the reviewer dismissed your work at first and even said so in print. But it sounds like he went back through your your pieces and viewed them with a different perspective, and saw content and depth and promise. Maturity in art is fine. But ultimately, isn’t it the viewer’s visceral response that gives it value? He admitted your works touched something in him. That shows that you made contact in a positive way. Here’s to future successful showings with glowing reviews! I guess the thing that’s strange to me is that he chose to review my stuff out of all the artists’ work that was exhibited acrosss town that night. Surely there were 100 artists or so whose work opened, when you think of there being maybe 30 galleries, many with groups exhibits. And I was a total unknown–total unknown, so something caused him to focus the week’s review on my stuff. That actually is just now occurring to me————— Thanks for reading, Maura! I think I’ve said this before. It takes tremendous courage to exhibit one’s artwork. Hell, I never even put my paintings on the wall until Then Husband dug them out of the closet. You are gifted. Your work clearly speaks to people. The rest is immaterial. And yes, the fact that the reviewer chose your work means he actually SAW it, as opposed to it going by his eyes in a blur, which I’m sure a lot of other work does. That speaks to the power of the work. I took a positive vibe from that article, but I understand (too much, unfortunately) how easy it is to expect the critique and spot the negative when viewing your own work. Glad you re-read this with fresh eyes, and I hope you see what we all do, Kathy, the brilliant artist! You’re so sweet, Tori! The good thing is that now I don’t care as much what he said or thought or wrote. Like I said–the difference a decade makes! Take care, my friend! He’s just one guy…some people like my cooking, and some people don’t! Excellent point, Dana! Think Picasso, for example. Thanks for this important reminder–don’t know why that didn’t occur to me! Oh, well, that’s what friends are for–eh?! I believe it was Channing Pollock who said “A critic is a legless man who teaches running.”…Just a random thought brought on by your fine post. Wow, that is a great quote–one I need to write down and commit to memory! Thanks, Charles! 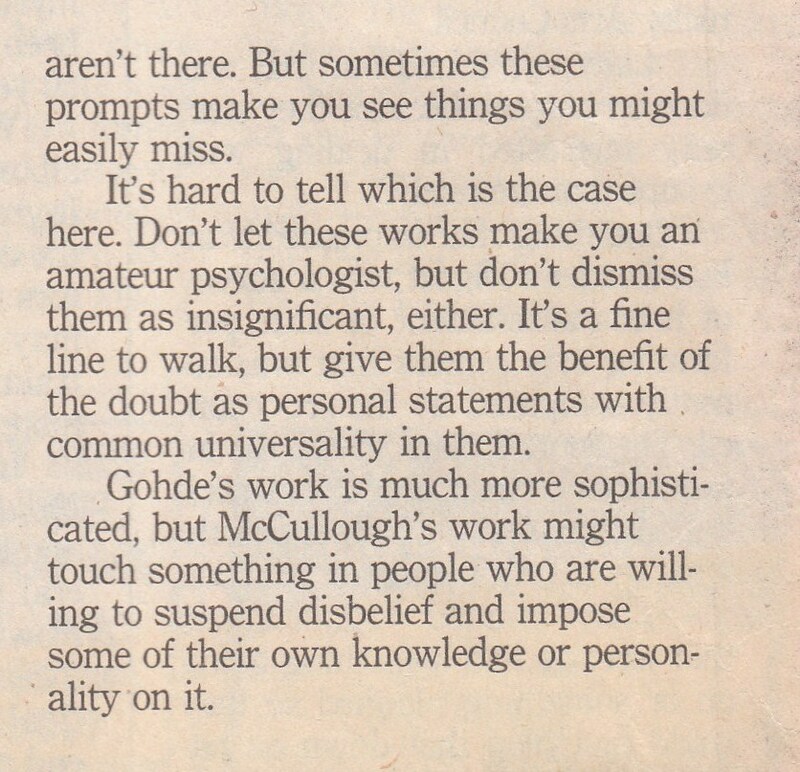 I did have to laugh: he made a big deal about how he got much more out of your paintings after reading your statement and wondered about “chicken and egg”, but I am pretty sure he would not have got all those “public space vs personal space” musings if he had not read Gohde’s statement. Double standards? Thanks, Karyn– That would be great if he thought they were deeper, but I’m not really sure what you mean my “smooth.” At any rate, it’s great to hear from you again–hope you will come back and maybe help me understand the “smooth” part. It IS amazing the difference a decade makes, Kathy. I definitely see that in my own life. I’m a much different person now than ten years ago and hopefully I’ll be a much different person ten years from now. Keep up the great work and an art exhibit could be fun. Yes, a lot can happen in a decade, can’t it? Isn’t it great we can continue to grow and change for the better as we get older!